We’d love your help. Let us know what’s wrong with this preview of Cannibalism, Headhunting and Human Sacrifice in North America by George F. Feldman. To ask other readers questions about Cannibalism, Headhunting and Human Sacrifice in North America, please sign up. Very interesting, but very repetitive. Basically recounts numerous stories related to the title will very little linkage or progression. Excellently researched and documented. Nature is red in tooth and claw. Scholars who have looked past A Charlie Brown Thanksgiving into what really happened with the Pilgrims at Plymouth Rock will know: human history is equally savage, bloody and brutal. funky cars after were not on a five-year mission to seek out new life and new civilizations. The natives they encountered were far from unspoiled agrarians who would cry at the first sight of litter. In more than a dozen chapters stretching from prehistory to the Indian wars of the Western Frontier, Cannibalism, Headhunting and Human Sacrifice in North America: A History Forgotten highlights select warlike tribes, conquistadors, Puritans, and horrendous individual atrocities which show our lauded forefathers at their worst. One example chapter covered the Calusa Indians of south-western Florida. Their name for themselves translated as "fierce people." They truly lived up to it. Whether dominating surrounding tribes or massacring Spanish sailors when treasure fleets wrecked upon the Florida Keys, the Calusa delighted in slavery, torture and human sacrifice. One young castaway, Hernando D'Escalante Fontaneda, was allowed to survive, and spent twenty years among them. Upon being released, Fontaneda returned to Spain and penned a memoir. Feldman brings its grisly details of life among the Calusa to modern readers. Diaries of missionaries, soldiers, and other original observers are extensively featured. The research supporting the chapter is impressive. These sources even convey an account of the first "mooning" in American history- of Catholic missionaries by the Calusa, who were firmly dedicated to their own religious beliefs! The author's interweaving prose is informed and engaging. A clear impression is conveyed concisely: the Calusa are the natives who shot Juan Ponce de Leon when he attempted to establish a colony in 1521, and whose savage ferocity held off Spanish might for two hundred more years. Feldman's book is culturally balanced: equal barbarity is illustrated from Indian, English, American, Mexican and Spanish parties. To continue with Floridian examples, Feldman describes the expedition of a conquistador named Panfilo de Narvaez. His force was annihilated, and given their extreme violence, arrogance and inhumanity, that was no injustice. Reading what horrors these nations inflicted upon each other, it becomes easier to understand the genocide which occurred on this continent. Cannibalism, Headhunting and Human Sacrifice in North America lets us know what lessons from history modern man should never be repeating. This book is extremely interesting because it breaks away from the conventional treatment of the period when Europeans were taking over the New World and the time before the Europeans set foot in the Americas. Author Feldman throws a monkey wrench into the fantasy that all was peaceful and lovely before the bearded beasts from across the Atlantic showed up. The stories Feldman tells illustrate a time (before and after the Europeans arrived) when (like Hobbes's description of the Dark Ages) life This book is extremely interesting because it breaks away from the conventional treatment of the period when Europeans were taking over the New World and the time before the Europeans set foot in the Americas. Author Feldman throws a monkey wrench into the fantasy that all was peaceful and lovely before the bearded beasts from across the Atlantic showed up. The stories Feldman tells illustrate a time (before and after the Europeans arrived) when (like Hobbes's description of the Dark Ages) life was nasty, brutish and short. Feldman did painstaking research before he locked horns with the professional historians who had already described these times as placid, and the fruits of that research are obvious to reader of his book. This book is not for everyone, only for those who want a true and accurate depiction of the Indian tribes and nations and of the Europeans who conquered them. If you'd rather not read a book that involves cannibalism, headhunting, and gruesome torture, then something like "Little House on the Prairie" might be a better read for you. But for me, my hat is off to Feldman, and he has my congratulations on a job well done. All I want to know is, "When does your next book come out?" I wish this book had come out when I was working on my capstone paper in undergrad-it would have been a fun addition source to add to my survey of Iroquois-Algonquian wars. Its not lurid, and it is not condemning of cultures. This book is not a rage at history going soft on the Native Americans nor is it trying to re-establish the old narrative of savage brutes. Settlers are included in the descriptions of shocking acts. The author is clearly sympathetic to Native American history. It is simply t I wish this book had come out when I was working on my capstone paper in undergrad-it would have been a fun addition source to add to my survey of Iroquois-Algonquian wars. Its not lurid, and it is not condemning of cultures. This book is not a rage at history going soft on the Native Americans nor is it trying to re-establish the old narrative of savage brutes. Settlers are included in the descriptions of shocking acts. The author is clearly sympathetic to Native American history. It is simply that he, like myself, feel that the condescending hippy-earth-mother Hollywood image of Native Americans is just as historical incorrect as the older racist view was. 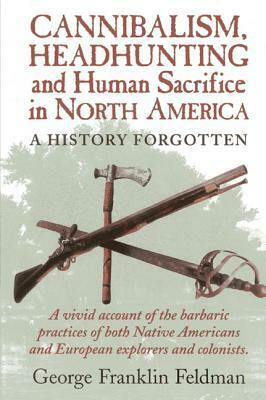 This book claims to be about human sacrifice and cannibalism in North America. It pretty much addresses mostly second-hand reports of such behavior concentrating on the practices of the Natives while barely touching on the behavior of non-Native Americans. This book is an eye-opener. It is documented thoroughly and accurately and teaches all mankind that living in peace with respect for one another far outweighs this barbaric, historic alternative. Quite a comprehensive and serious history lesson. More in-depth than I was anticipating, but enjoyable and very informative. Not for the squeamish. Vivid and graphic without becoming macabe, well researched, Feldman produces a fine work of academic anthropology that is interesting as well as informative. Worst book I've ever read. It could have made it's point in about five paragraphs.